Go on a fabulous match-3 quest in Italy! 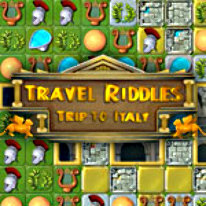 Rome, known as The Eternal City awaits you with its riddles and challenging puzzles. Collect more than 80 artifacts in awesome match-3 levels all while travelling to the most beautiful sights Italy has to offer. Numerous, might power-ups will help you to achieve the highest score. Continue your journey across miraculous fields of Tuscany, the romantic channels of Venice and beautiful streets of ancient Milano. Don’t forget to have a cup of tea in a Sicilian café after leaving Vesuvius and Naples. Each new level is more challenging than the last, so prepare for an exciting time! Your journey around the world continues! Welcome to Italy!